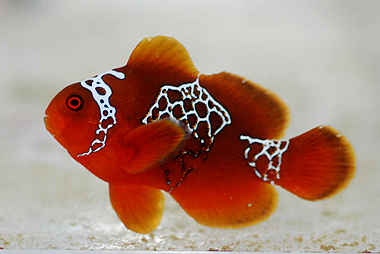 A Lightning Maroon Clownfish was posted on Blue Zoo Aquatics’ website, and then quickly sold for $2500. Originating from Paupa New Guinea, the Lightning Maroon clownfish is simply stunning, with a brilliant maroon body, and marked with extremely unique “artistic” patterns. This particular fish was sent to BZA viw SEASMART, a New Guinea program designed to benefit the fisherman who collect the fish. We will post more photos of this beautiful clownfish species shortly. Sustainability, Equitability and Profitability are the three core goals of the SEASMART program for the development of a marine aquarium trade in Papua New Guinea (PNG). Building on local tradition and customs, supported by international market demand, and utilising cutting edge technology and traceability mechanisms, the EcoEZ SEASMART Program is helping to create a new natural resource trade in PNG that is changing the way natural resource exploitation is carried out, ensuring local management control, resource extraction sustainability, product traceability and industry profitability. The PNG SEASMART Program is a joint effort by the PNG National Fisheries Authority (NFA) and EcoEZ Inc. The SEASMART Program is working with PNG’s National, Provincial and local governments, educational and development institutions, the donor and investment communities, and international and local businesses to efficiently develop the marine aquarium trade throughout the country. Crazy, but awesome. Almost doesnt look real. Sweet looking fish. Somebody breed them to get the price down.